All 256 Dutch Bros locations banned together with their communities for Dutch Luv Day, on Feb. 14 to raise $234,030 to support for local food banks as they purchase healthy and nutritious food for community members in need. Dutch Bros raised funds for local food organizations; ultimately allowing for its biggest Dutch Luv Day donation. 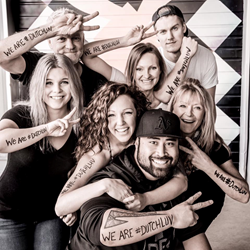 Dutch Bros’ annual Dutch Luv Day raised $234,030 amounting to 1,638,210 pounds of food for local communities. Every year, Dutch Bros celebrates Valentine’s Day by loving on their communities. On Feb. 14, known in the Dutch Bros world as Dutch Luv Day, all 256 locations in seven states raise funds, as well as awareness for local food organizations. This year, all Dutch Bros locations donated $1 from every drink sold. On average a $1 donation allows food banks to purchase 7 pounds of nutritious food that immensely benefits people in need. Together, with the help of their communities Dutch Bros was able to raise $234,030 for local food organizations, which allows food banks to purchase 1,638,210 pounds of food. In turn, providing 1.3 million meals for local families and people in need of support. By shifting Dutch Luv day from a canned food drive to a $1 per drink sold, Dutch Bros was able to increase the pounds of food raised from 487,966 pounds in 2015 to over 1.6 million this year. Dutch Bros Coffee is the country’s largest privately held, drive-thru coffee company, with over 250 locations and over 5,000 employees in seven states. Dutch Bros serves specialty coffee, smoothies, freezes, teas and a private-label, Dutch Bros Blue Rebel™ energy drink. The rich, proprietary coffee blend is handcrafted from start to finish. Every ingredient is measured, every process timed, and every cup perfected. Dutch Bros Coffee is headquartered in Grants Pass, Ore., where it was founded in 1992 by Dane and Travis Boersma, brothers of Dutch descent.